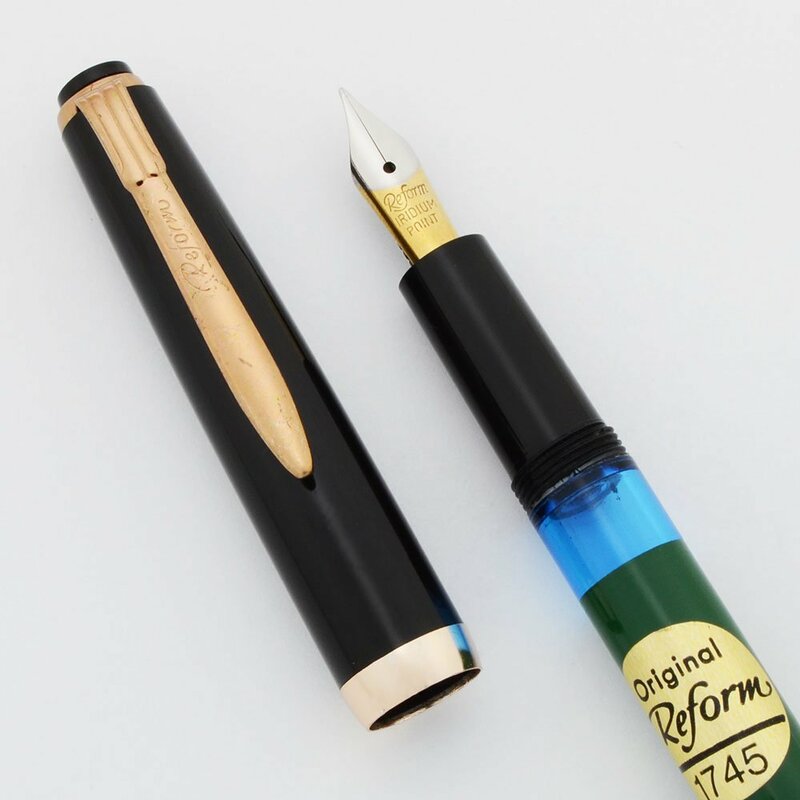 A Reform 1745 fountain pen. This is a slim piston filler similar to the Pelikan 100 fountain pens. It has a gold plated fine nib and is in very nice condition with plating wear. The pen works very well. Manufacturer and Year Reform, Germany -- Likely 1970s, the model was produced until the mid 1990s. Filling System Piston filler. It's been tested and is working well. Color Green barrel with black cap, section, and piston knob. It has gold plated trim and a blue viewing window to see when the pen is low on ink. Nib Fine formerly gold plated nib. The plating has worn away from the front half of the nib. The nib is unlabeled but it has longer and narrower tipping material than our other Reform 1745 so we're calling it a fine. It is smooth and springy. Condition Very Nice condition. No chips, cracks, dings, dents, or personalization. The barrel has some marks around the viewing window and the clip plating is worn. The nib has plating wear as well. The viewing window is clear. The piston knob moves well and there is no staining in the plastic piston seal.